One of the more challenging arm balance yoga positions. It requires upper body strength and lower back flexibility. In the complete posture the feet are placed on the head which relieves the spine of pressure. This requires tremendous back flexibility but this posture can be done as a great back stretch in your yoga sequences. The breath sways the body. Short shallow breaths may be more beneficial in the learning stages of this pose. You can let the legs hang apart or unite the inner big toes with a little force. The fingers are really important in maintaining balance. Applying pressure on them and releasing them in harmony with the breath can give you a security and balance. 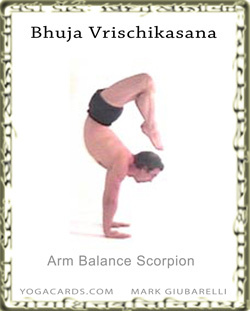 This enables you to relax for a long period of time in the Arm Balance Scorpion. Try to build up arm strength and back flexibility before performing these kind of postures in class. If practitioners are practicing in a class without a wall they will be falling over. Even with a wall the back is vulnerable because of the force and weight of the legs. This pose should be done only in advanced classes.